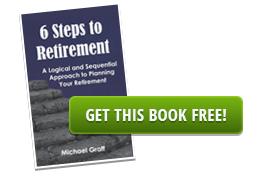 “6 Steps Retirement” is a specially designed retirement income planning process. It was developed to assist our clients to systematically organize, evaluate, and leverage their financial resources into a retirement cash flow that is predictable, sufficient, and sustainable. The reality is that most retirement and financial service providers are product focused, featuring their particular brand of investment and/or insurance products. Ours is a planning first approach that is designed to help you achieve an efficient and effective income that will support your desired retirement lifestyle and will last a lifetime. 6 Steps Retirement is much more than just investing your money and helping it grow. It’s about helping you effectively leverage and protect your hard earned savings so you may confidently achieve and maintain the lifestyle you have aspired to.